19th C Continental School watercolour of an Italian lake. 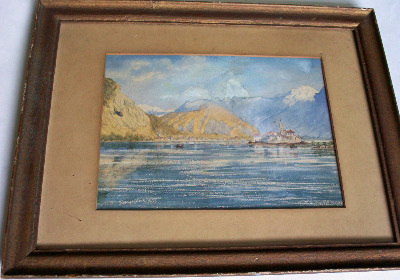 Italian lake scene, Isola Pescatore, Lago Maggiore, watercolour on card, 19th C Continental School, obscure signature. SOLD 28.11.2014. Watercolour on card, obscure signature lh corner, framed and glazed. Dimensions : Frame : 368mm x 284mm x 21mm. Image : 224mm x 164mm. Weight : 0.850kg net. Condition : Quite good. 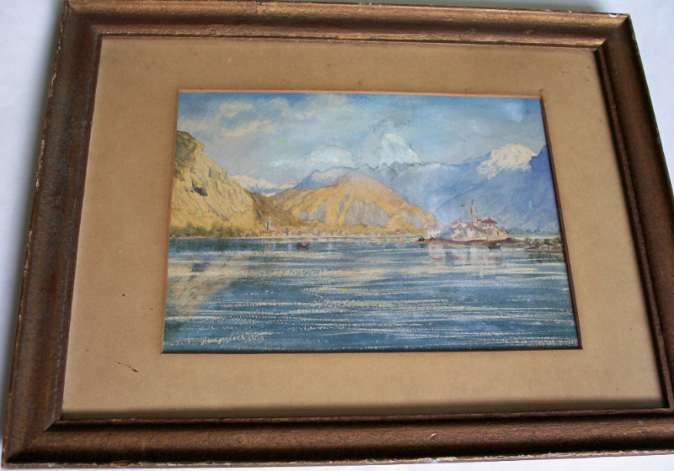 Italian lake scene, Isola Pescatore, Lago Maggiore, 19th Century Continental School, watercolour on card, with obscure signature lower lh corner, framed and glazed. Dimensions : Frame : 368mm x 284mm x 21mm. Image : 224mm x 164mm. Condition/Notes : Quite good condition. 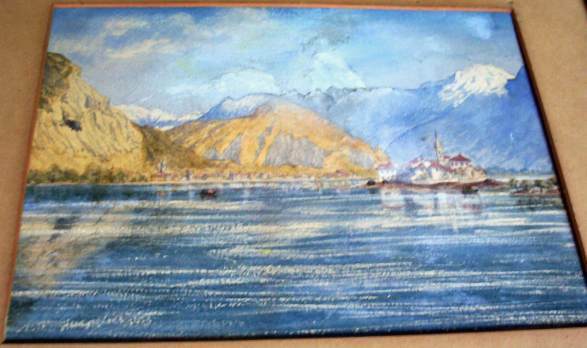 The watercolour painting depicts the famous Italian lake, Lago Maggiore with Isola Pescatore and the small town along the shore with a couple of small boats. The artist has skillfully captured the reflections in the lake and the grandeur of the cloud capped mountains in the background. The original pencil sketch can be seen on close examination. 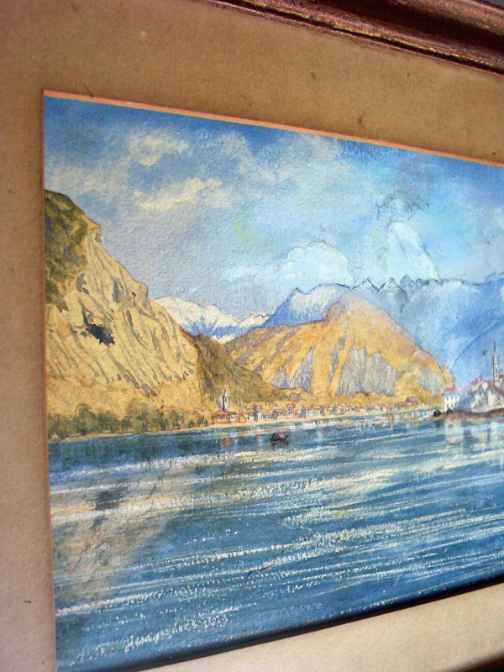 The colours are good for a painting of this age and the blue haze effect accurately portrays the illusion created by distant mountains in the heat of the day. There appears to be an obscure signature in the lower lh corner but it is very difficult to make out. There is no sign of foxing or moisture on the painting. The old mount board is dusted and the cut edges of the window toned. There are several marks around the mount and a cut to the surface in the lower lh corner 15mm from the lower lh window corner. The original wooden frame is scuffed and chipped around the edges but robust and secure. 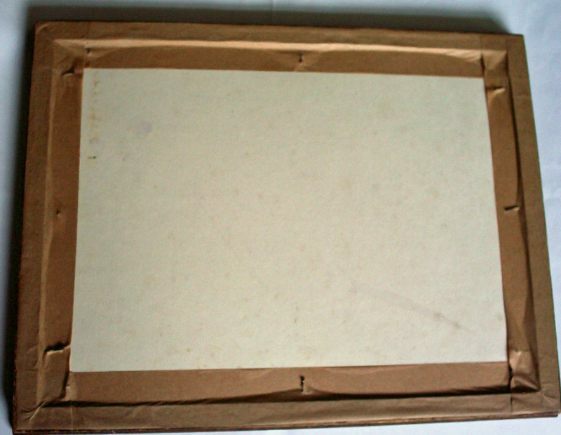 The back is covered with a blank card held in place by panel pins and sealed with 35mm gummed framing tape. Overall, an interesting watercolour which will benefit from identification of the artist. Shipping Bands : UK : J. Europe/World : FIXED RATE 2/BAND I.